Lots of readers have written with their favorite travel stories in response to my recent post. Long lines at security checkpoints continue to lead the tales, with at least two readers noting trips where the TSA PreCheck lines were longer than the regular ones. Lots of people are frustrated with the summer surge in travelers, many of whom aren’t used to packing their liquids appropriately or getting rid of their drinks before trying to go through the scanners. I have one friend with a pilot’s license who flies himself to jobs. I went with him once and have to say there’s something to be said about boarding at the local general aviation terminal and heading on your way. His company pays for the trips as long as they’re equivalent to the cost of a commercial ticket, but they did have to get a special waiver for insurance reasons. I’m still waiting for my red-light ticket, which I imagine will come in four to six weeks once it makes its way through the rental car company data trail. I have a little bit of a bet with my partner, who thinks it will come much faster. Considering the wager, I’m optimistic that he’ll be reconciling the travel expenses this quarter instead of me. There’s always a chance I’ll get stuck with it again as well as having to pay the ticket, but where’s the fun in not taking advantage of a friendly wager? It’s been a fairly low-key week and I’ve been glad to be working from my home office. It’s nice to have a 20-foot commute and be able to work in shorts and flip flops for a change. It’s also probably been good from a career preservation perspective since I’ve been on a lot of calls where had I been there in person, my facial leakage would probably have gotten me fired. Sometimes it’s the little things that just make you smirk uncontrollably. One of my consulting offerings is around conducting effective meetings and I’ve not only identified some candidates for additional services, but added some examples to my teaching arsenal. I’ve mentioned before that I typically schedule 25- or 55-minute meetings rather than 30- or 60-minute meetings. This allows people to reset and recharge before the next meeting as well as clear the room and get organized. Of course, not everyone subscribes to that strategy which often leads to overlapping conference calls. It’s always awkward to come on the line in the middle of a call in progress, especially when all you were trying to do was arrive early so you would be prepared. On one call this week, I arrived to find the moderator saying that, “It sounds like a couple of people here have a hard stop, so we’ll have to go ahead and end the meeting.” Yes, when your meeting time is up, it’s a good idea to end it regardless of whether everyone has a hard stop or not. Just because some people are willing to stay over doesn’t make it acceptable. I also had so many calls that didn’t start on time that I started keeping a tally. The worst was a call that actually started 22 minutes into its allotted time. Although I hate wasting people’s time and money, as a consultant sometimes it’s my job to stay on the call until the client dismisses me. This one was particularly painful because it was scheduled to allow a prospective vendor to present its solution to my client. I had been engaged to help the client evaluate the solution since they’re a small practice and don’t have a lot of experience in this particular area. I’m certainly not impressed by a vendor that shows up late and isn’t prepared. I understand that sometimes inevitable things happen, but those are situations where one wants to call or text or do something to let people know you’re not just standing them up. My other favorite is when people feel the need to make sure they say that the group is pausing for a “bio break” or a “coffee dump” or some other description of bodily functions. When did it stop being OK to simply say, “Let’s take a 10-minute break?” Do we have to discuss exactly what people are going to do during the intermission? One of my calls this week was an all-day strategy meeting, which had several examples of restroom-related euphemisms. I was grateful, though, that it had a formal lunch break rather than a working lunch. Although my headset has enough range to get to the kitchen and make a sandwich or reheat some leftovers, I always worry that I will forget to put myself on mute. 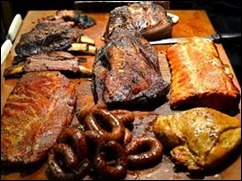 I was jealous though of the outstanding Texas barbecue that I knew was being eaten on the other end of the conference call. I had to be content with my chicken salad sandwich, but that’s how it goes. I spent all day Tuesday creating recorded training materials for a client. They’re getting ready to migrate to a different EHR and ran out of steam in getting ready to train their end users. I long ago made my peace with Adobe Captivate and don’t mind doing the recordings, especially when it means not having to travel. They can be tedious at times, but fortunately the client realized that it’s still more efficient to hire someone to do it who has done hundreds of them rather than struggling trying to create them on their own. Fortunately, they had created most of the scripts and I just had to do some minimal polishing before digging in. I also had the chance to attend a couple of educational webinars, which is a rare treat. They’re nice because I don’t have to present and can actually absorb information. Sometimes if I’m lucky and can plan enough in advance, I’ll hit the treadmill while I tune in, but that’s a rarity. This week I was able to catch up on some laundry folding and pack my suitcase while reinforcing my knowledge of MACRA and MIPS. I’m back on the road in the morning for a quick proposal presentation to a prospective client, and as long as the travel gods are smiling, I’ll be home by dinner time. I hope they end up accepting it because they seem to be a really cool medical group that is already moving in the right direction but just needs a little boost. Those are my favorite kinds of clients, and the fact that they’re in a cool city doesn’t hurt. What are your thoughts about the summer travel season? Where is your next great trip? Email me. If a vendor can’t be on time during the sales process what should your expectations be if you buy from them? Either they don’t really need your business or are just clueless.